Richard Lee Norris accidentally shot himself in the face 16 years ago and for years had to put up with being stared at in public, but not any longer. For years Richard Lee Norris had to put up with being stared at in public – but no more. Now the 38-year-old from Hillsville, Virginia, in America is as anonymous as the next guy, and that’s just the way he likes it. 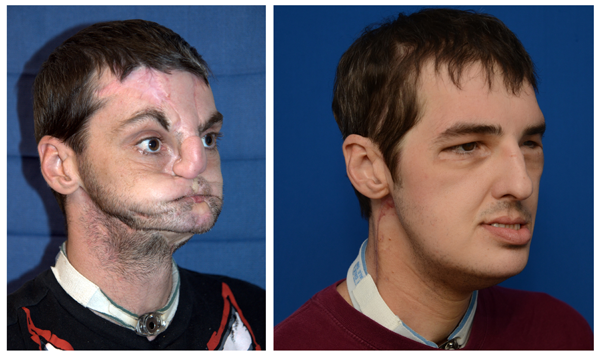 Richard destroyed his features when he accidentally shot himself in the face 16 years ago. Although a series of operations patched him together again he was left severely disfigured and without a nose, teeth, most of his upper and lower jaws, and with only part of his tongue. Then last year a team of 150 doctors carried out one of the most complex facial transplants in history, carefully replacing his jaws, teeth, tongue, muscles and nerves. In the year since the transplant Richard has gradually regained feeling in his face and is even starting to show expression. Motor function on the right side of his face is 80 per cent normal, and 40 per cent normal on the left side. As part of his new life an increasingly confident Richard is taking online classes for a degree in information systems. He’s also working with photojournalist Coos Hamburger who recently launched a book about Richard’s incredible journey called The Two Faces of Richard. After almost two decades Richard is finally able to recognise himself as the man he once was. “When I look in the mirror I see Richard Norris,” he says.